Craft beers for sale in Chicago. Craft beer has about a 6 percent market share in the U.S. beer market, which is dominated by Anheuser-Busch InBev and MillerCoors. Innovators, however, are challenging that dominance in the form of craft beer breweries. Small mom-and-pop-style breweries — or regional breweries — now account for about 6 percent of domestic beer sales. That may seem like a small number, but it's been growing every year since the early 1990s, while big brewers' share is declining. At Meridian Pint, a trendy D.C. bar and restaurant, you wouldn't even be able to order a Budweiser, Coors or something else from the big two. "I try to have a nice mix of approachable craft beers, as well as exciting new stuff for people who have tried a lot of everyday beers," says Sam Fitz, the beer director for Meridian Pint. He's a Cicerone, which is like a sommelier for beer. Meridian Pint offers brands such as DC Brau, Flying Dog and Oxbow. Fitz says he prides himself on this kind of handpicked selection, but there are some brands he won't carry. "I do not carry any beer that comes under the Miller or Coors or Bud labels," he says. That's just fine with his customers, like Landon Rordam, who says he isn't looking for those big names but instead tries to find something he hasn't tried before. Consolidation of the big brewers also worries the Justice Department, which recently blocked an attempt by Anheuser-Busch InBev to buy the 50 percent of Grupo Modelo it does not already own. The Mexican beer maker, the world's third-largest, owns Corona, Negra Modelo and other brands. Journalist Elizabeth Flock, who reported on the blocked merger and the beer market for U.S.News and World Report, says the Justice Department said AB-InBev, by buying Grupo Modelo, would effectively eliminate its competition. The problem for craft brewers, Flock tells Jacki Lyden, host of weekends on All Things Considered, is that those sorts of mergers make the fight against big beer companies even more difficult. "Everyone wants to be on grocery store shelves at eye level," Flock says. "Craft brewers say big beer is increasingly pushing them out of those prime spots." There's also the issue, Flock says, of what the Brewers Association calls "crafty" beers — beers owned by big beer companies disguised as small craft beer. A common example is Blue Moon, a Belgian-style beer. "A lot of people think that [Blue Moon] is a craft beer, but it is in fact owned by MillerCoors," she says. Craft brewers argue that this limits consumer choice, Flock says. For instance, if a bar stocks the top brands from a big brewer along with these "crafty" beers, consumers are essentially only buying from a single company. Not everyone agrees. Benj Steinman, an editor for Beer Marketer's Insights, a trade publication, says these so-called crafty beers might be helping the craft beer market. "What we've called for is a transparency of parent company ownership, and to put that on the beer label so the beer lover has a chance to know who's behind those brands," she says. "A lot of millennials are associating themselves with what they consume and what they hold in their hand," she says. Craft beers are, without question, more expensive, which might make it harder for them to compete against the bigger brands. "This is a very middle-class beverage, [a] working-class beverage," says Chris Thorne, a spokesman for the Beer Institute, the largest beer industry trade group. "So what a lot of people are looking for is what's affordable." Thorne says fierce competition is nothing new in the beer business: It's been that way since the days of Fred Miller, Freddy Heineken, Adolph Coors and August Busch. "These are names that are rooted in our heritage, in the beer-drinking culture in the U.S., and they never got a break," Thorne says. "They competed with each other." Back at Meridian Pint, beer director Fitz shows off his 24 beer taps, all pouring high-end craft brews. He really doesn't want to lose that market share to beers pretending to be microbrews. "It certainly is more expensive, but for what we're trying to do, we're trying to offer the highest-quality products that we can," he says, "and that means buying from producers that use good ingredients and are innovative producers." In the bar, customer Rordam says even if he has sampled some upscale microbrews at $6, $7 or $8 a pint, those prices might eventually force him to go back down the ladder. "After I've had like three or four microbrews, I'll think, 'Wow, that was $25 [or] $30, I should probably get a Bud Light now because this is getting ridiculous,' " he says. Coming up this St. Patrick's Day, a wrap-up of music from South by Southwest and why manipulative photography isn't new. But first, it is St. Patrick's Day and chances are right now, someone is singing "Danny Boy" and hoisting a pint. Americans love their beer. It's the world's most popular drink but most of us know even less about the beer industry today than we do about how St. Patrick chases snakes out of Ireland. So belly up. UNIDENTIFIED MAN #1: Refreshingly smooth by Coors Light. UNIDENTIFIED MAN #2: It's Miller time. UNIDENTIFIED MAN #3: Heineken. Sounds good. LYDEN: That's our cover story: big, big beer and this oddly fight to be America's draft. LYDEN: Beer, we drink enough fermented hops to consume more than $200 billion annually, and that's just here in the U.S. What you should know as you sip is that 90 percent of our domestic beer market is dominated by just two companies, Anheuser-Busch InBev and MillerCoors. But small brewmeisters are challenging that dominance. Craft beer that has smaller mom-and-pop-style breweries or regional breweries now account for about 6 percent of domestic beer sales. Now that might seem like a small number, but it's been growing every year since the early 1990s while the big brewer's share is declining. So let's begin by raising a glass at Meridian Pint, a trendy joint here in D.C. where you get run out of town if you try to order a Coors. Brian Davis is a graduate student, and he's drinking a Nugget Nectar. BRIAN DAVIS: Really intense flavor and you know that you're supporting organizations that you care about, local economies. LYDEN: You'll have a lot of choices in the future, too, now that there are more small breweries than there were before prohibition when beer was largely a regional business. And if you're really into beer, you can become a certified cicerone. That's like a sommelier only for beer. Sam Fritz is a cicerone. SAM FRITZ: I try to have a nice mix of approachable craft beers as well as exciting new stuff for people who have tried a lot of the more everyday beers. LYDEN: Sam Fritz is also the beer director for Meridian Pint, which also offers DC Brau, Flying Dog and Oxbow Space Cowboy. He prides himself on offering this kind of handpicked collection. FRITZ: I do not carry any beers that come under the Miller or Coors or Bud labels. LYDEN: That's just fine with his customers. Beer drinker Landon Rordam says he's not looking for those big names. LANDON RORDAM: When I go out to a bar, I really - I'm almost always looking for what haven't I tried before. LYDEN: Last month, the Justice Department blocked an attempted merger between Anheuser-Busch InBev and the Mexican beer maker, Grupo Modelo. Anheuser already owns 50 percent of the Mexican beer maker. 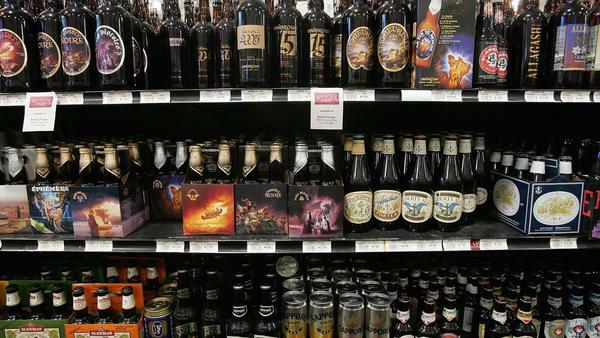 Journalist Elizabeth Flock wrote about this and other trends recently in the beer market in U.S. News and World Report. ELIZABETH FLOCK: The Department of Justice has said that this merger would get rid of their competition. Anheuser-Busch is the biggest beer company in the world. MillerCoors is second, and Grupo Modelo is third. So if they were to buy Grupo Modelo, they would effectively get rid of their biggest competition that they could possibly own. LYDEN: So, Elizabeth Flock, you've written that the market shares of the great big companies, Anheuser-Busch InBev, is actually declining. What would a merger like that mean for the little craft breweries that we see, and how much of the market do they have? FLOCK: So big beer - when I say big beer, I mean Anheuser-Busch InBev and MillerCoors, currently have 90 percent of the market. And craft beer in the U.S. has 6 percent. And craft beer has said - even though they're new, they've only really been around since the '90s - that 6 percent is too small and 90 percent is too big. And that big beer is increasingly trying to keep craft beer down and that this merger would just be sort of another step for big beer to be able to keep craft beer out, keep independent beers off the shelves away from consumers. LYDEN: And how are we defining a craft beer? FLOCK: Big beer likes to say that craft beer is just a marketing term. Craft brewers, on the other hand, would contend that craft beers are small, independent, family-owned. And they say that craft beer cannot be more than 25 percent owned by a big beer company and that it also cannot make more than six million barrels of beer a year. LYDEN: Maybe just to compare, tell me how big the corporate beer makers, the big beer makers actually are. FLOCK: So I know that Anheuser-Busch with just 14 of their 200 brands gets a billion dollars a year in revenue. And so, you know, when you have 200 brands, that effectively can take over store shelves. LYDEN: That's another area where these brewers compete, isn't it, just on the shelf space. FLOCK: Absolutely. I would say that this is the number one place where this battle between craft beer and big beer is sort of playing out because everyone wants to be in grocery store shelves at eye level. When a consumer goes and is just sort of scanning, they want to be there. And craft brewers say that big beer is increasingly pushing them out of those prime spots. At grocery stores, at bars, at sporting arenas, at airports, anywhere you can find a beer, they say they're increasingly being pushed out. LYDEN: So there's a couple craft beers that you cite as being owned by a huge company. You called these crafty beers. What do you mean by that? FLOCK: The Brewers Association, it's sort of a term that they use to knock big beer for calling it crafty beer. And, you know, one of the things that they're most upset about that this sort of deceptive tactics that they say big beer is using is to present beers that they make - that Anheuser-Busch or MillerCoors make as craft when they aren't. So a really good example of this is Blue Moon. Blue Moon is an enormously popular beer. You can find it anywhere. A lot of people think that it's a craft beer, but, in fact, is made by MillerCoors. LYDEN: So Blue Moon now owned by MillerCoors. How do they advertise? Do they switch their advertising for something like the crafty beer? FLOCK: You increasingly see big beer companies trying to advertise to the kind of person, a hipster type or someone who's really into, you know, sort of a distinctive beer. UNIDENTIFIED MAN #4: In a (unintelligible) that has it all, we've come to (unintelligible) where there's culture around almost every corner. Today in a converted garage turned rock club, we're parked for a burger, a beer and you get to know a great band. Check it out on the local scene presented by Blue Moon. LYDEN: In terms of the market, does it matter? Are these small beers, the craft beers, are they really getting squeezed out? FLOCK: What craft brewers would say to that is they would say, what matters is that consumers aren't getting choice. So they might go to a bar and there might be eight beers on tap. And you might see that one is, you know, Bud Light and one is a so-called craft beer, and then one is an import beer. It seems like there are eight different beers, but, in fact, all of those beers could be made by Anheuser-Busch. So does it matter? Maybe not. Maybe you like all of those beers and you feel like you're getting a variety, but, in fact, you're only getting a variety from one beer maker. LYDEN: And also, the craft brewing trade, as it has blossomed from - I think your article said that at one time, there were maybe just a couple hundred individual beer makers, but now there's more than a couple thousand. LYDEN: This has obviously created a lot of jobs, a lot of vitality in different parts of the country. FLOCK: Yeah, absolutely, although big beer would say that they create infinitely more jobs. And so to try to tamp down what they're doing would be to hurt the American economy, we'd get rid of jobs and that craft beer just doesn't employ nearly as much. LYDEN: Elizabeth Flock has reported on the beer industry for U.S. News and World Report. Crafty beer, though, might really be helping craft beer, says a 30-year veteran of the business. Benj Steinman is an editor for Beer Marketer's Insights, a trade publication. The beers he's talking about are Blue Moon and Shock Top. BENJ STEINMAN: Some might say, well, what Anheuser-Busch and MillerCoors have done through Shock Top and Blue Moon is opened up a greater number of consumers to the universe of craft beers and their innovation, flavor and variety, and they don't necessarily - and they're sort of gateway beers. LYDEN: Gateway, meaning it's a more accessible craft beer. It might get you to start wanting to taste other things with notes of dark cherry or sassafras molasses. Julia Herz is the craft beer program director for the Brewers Association. She says big beer should print its names right on all its bottles. JULIA HERZ: What we've called for is a transparency of parent company ownership and to put that on the beer label so the beer lover has a chance to know who's behind those brands. LYDEN: Herz says that branding matters to a lot of younger beer drinkers who are actually quite careful readers. HERZ: Many people care about the brands of what they consume and who owns those companies. And especially a lot of millenials are, you know, associating themselves with what they consume and what they hold in their hand. LYDEN: Craft beers are, without question, though, more expensive, which might make it harder for them to compete against the bigger brands. CHRIS THORNE: This is a very middle-class beverage, a working-class beverage. So what a lot of people are looking for is what's affordable. LYDEN: That's Chris Thorne. He's a spokesman for the Beer Institute, the largest beer industry trade group. He says that fierce competition is nothing new in this business. It's an American tradition. THORNE: When you look at the names of some of these breweries that we have today, whether it's Frederick Miller, whether it's Freddy Heineken waiting with - off the shores of New York for prohibition to end and come in, whether it's Adolph Coors, whether it's August Busch. These are names that are rooted in our heritage, in the beer-drinking culture in the United States, and they never got a break. They competed with each other. LYDEN: And back at Meridian Pint, beer director Sam Fritz shows off his 24 beer taps, two dozen high-end brands. And he really doesn't want to lose his market share to beers pretending to be microbrews. FRITZ: It certainly is more expensive, but what we're trying to do, we're trying to offer the highest quality products that we can. And that means buying from producers that use good ingredients and are innovative brewers. LYDEN: But at the end of the day in the barroom, Landon Rordam says that even if he sampled some upscale microbrews at six, seven, eight bucks a pint, he might go back down the ladder. RORDAM: After I've had, like, three or four microbrews, I'll think, wow, that was 25, $30, I should probably get a Bud Light now because this is getting ridiculous, you know? LYDEN: Then again, beer is for all occasions. Chances are that today, a lot of people are drinking green beer without much taste and enjoying every emerald drop. UNIDENTIFIED GROUP: Beer, beer, beer, beer, beer, beer. UNIDENTIFIED MAN: (Singing) A long time ago, way back in history, when all there was to drink was nothing but cups of tea, along came a man by the name of Charlie Mops, and he invented a wonderful drink and he made it out of hops. Transcript provided by NPR, Copyright NPR.